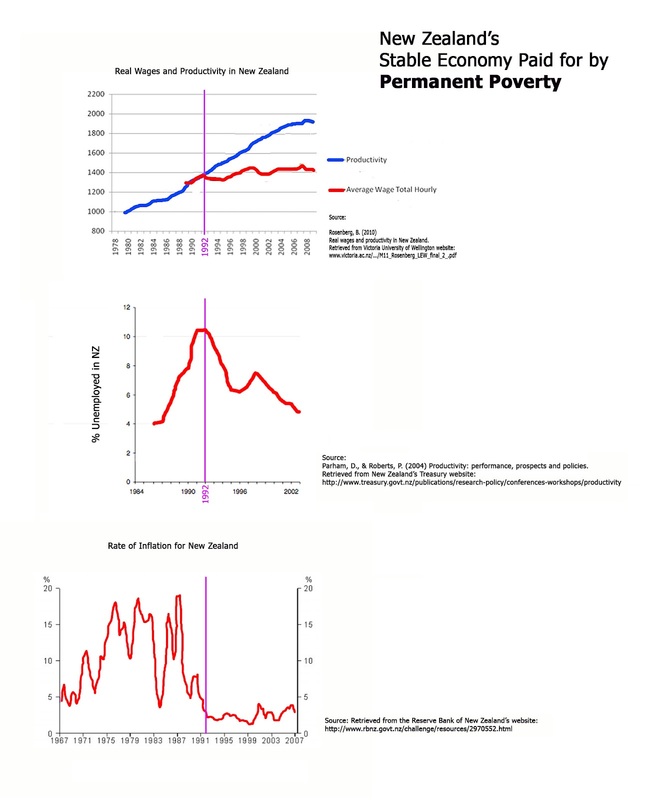 I am interested in exploring poverty in New Zealand and its intimate connection to wage rates, unemployment and inflation. Over the last thirty years in New Zealand we have undergone transformative reforms in the economic and welfare sectors. The effect has created a significant increase in the gap between rich and poor, to where today ours is one of the largest in the world (Donaldson & Hubbard, 2011), suggesting that we don’t have welfare in New Zealand, but well-orchestrated poverty. According to Bill Rosenberg, Economist and Director of Policy at the New Zealand Council of Trade Unions [CTU], wages rose on average according to the rate of productivity up until 1992. However, after 1992, productivity continued to rise at a steady rate, and wages on average did not (Rosenberg, 2010). If we look at data on the New Zealand Treasury website which shows us unemployment rates since 1986, we can see in 1992 the largest spike in unemployment in New Zealand history, with almost eleven percent of the population registered as unemployed (Parham & Roberts, 2004). Could these two sets of data be related? According to Alister Barry in his documentary, In a Land of Plenty, they clearly are; “the reserve bank would manipulate interest rates so that at any given time one hundred to one hundred and fifty thousand kiwis would be unemployed....more unemployed people competing for jobs was bound to drive wages down” (Barry, 2002). A precedent was set that was then to become the norm. But why would the government want New Zealanders to have a low wage? It is one way to control inflation, and maintain great wealth for the few (Barry). This is clearly demonstrated by the Non Accelerating Inflation Rate of Unemployment [NAIRU], which defines the lowest level of unemployment an economy can handle without causing rising inflation (Wikipedia.org, n.d.). New Zealand’s NAIRU is currently estimated to be five percent (Johnston, 2011), our current unemployment rate is 6.8% (Trading Economics, n.d.), and correspondingly our inflation is very low (Trading Economics). When unemployment was high in 1992, inflation dropped to its second lowest in New Zealand’s economic history (Trading Economics), thanks to the unemployed. Right now New Zealanders have a new round of welfare reforms being implemented that continue the agenda set 1991. According to The New Zealand Herald, “anyone who turns down any offer of ‘suitable employment’ will have their benefit cancelled” (Collins, 2012). This is seen as a logical escalation of what was in place before; whereby the client was given “three chances” before they were cut. This reform continues to undermine the basic right of choice for a New Zealand citizen, as the Work and Income New Zealand [WINZ] case manager decides what is ‘suitable’ for the client. I was affected directly by the above scenario in 2010 as a person with part time employment (see www.wellsgroup.org) looking for full time work and receiving an unemployment benefit. After consultation with the Ministry of Social Development’s work brokers, where we discussed which were suitable and unsuitable jobs, I was immediately offered employment in the very role that I had identified as unsuitable due to my physical and mental health at the time. Despite there being many suitable jobs that I had expressed a direct enthusiasm for, I had no actual choice. Job ‘suitability’ was simply being used as a means to remove myself from their support. At the time I considered mine an isolated incident but having since worked alongside benefit rights advocates and meeting other cases, I understand this is an accepted procedure. In short I had refused to participate in what is now the very essence of welfare; a tool for applying pressure on existing jobs by falsely creating the impression that there are numerous able applicants available for a position. That pressure of course is applied using real people living on the margins of society in poverty. People growing more and more desperate and becoming increasingly prepared to accept lower and lower standards of living. This is the accepted way to manage the economy and control inflation. As Suzanne Snively of the Reserve Bank Board of Directors from 1985-92 has said: “...it was a manageable thing for the reserve bank to use employment and unemployment as a means to get wages down, it was far easier than any other means to get inflation down, so they used it” (Barry).